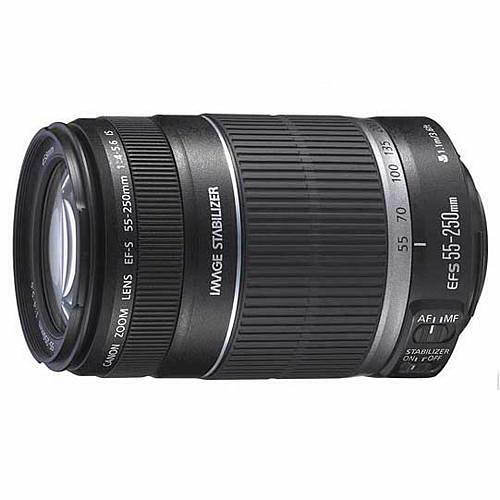 Lens Description: This telephoto zoom lens is designed with Canon\'s Optical Image Stabilizer technology while retaining compactness and lightness, in response to demands of photographers. This high zoom ratio lens is equivalent to a focal length of 88-400mm in the 35mm format (when used on Canon EOS cameras compatible with EF-S lenses), and the image stabilizer effect equivalent to a shutter speed about 4 stops faster than the same size lens without Image Stabilizer. In other words, if the slowest shutter speed you could formerly hold a 250mm lens steadily was 1/250th of a second, with Canon\'s 4-stop stabilization correction, you could hand-hold at shutter speeds as slow as 1/15th of a second. It also uses a UD-glass lens element to correct chromatic aberration for excellent image quality throughout the zoom range. This new EF-S telephoto lens with great features delivers excellent performance at an affordable price for all photographers.